The number of children cycling to school every day has more than doubled in one year, according to the latest Hands Up survey by sustainable transport charity Sustrans. Sustrans has been working with schools to encourage children to cycle through a variety of initiatives. 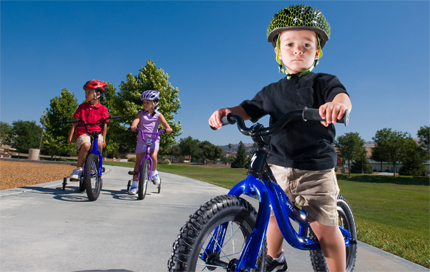 The number of children regularly cycling to school (at least once a week) has increased, rising to 26.6 per cent. The number of children being driven to school every day has dropped at schools that work with Sustrans – down from 27 per cent to 24 per cent in one year – cutting congestion on roads around schools. The figures are encouraging, particularly in view of the trend of declining numbers of children cycling to school since the ‘70s. Since then obesity levels in children have increased, and kids are spending less time outdoors. Sustrans chief exec Malcolm Shepherd said that encouraging children to cycle and walk to school is an easy way of incorporating exercise into their daily routine, whatever the time of year. In the current economic climate the cost of bicycles and equipment can be a barrier to some families. With Christmas approaching fast, many parents will be looking for ways to minimise the cost of presents whilst still getting that special gift for their child. Bikes4school by Cycle Solutions provides the perfect solution. More and more schools are signing up to this discount scheme which enables parents to save on the cost of most new bikes and accessories. Schools and PTA’s also benefit through the cash back they receive based on the sales generated. Further information on Bikes4School is available at www.bikes4school.co.uk.